Maryland-native rapper Logic debuts his seventh mixtape, topping Billboard charts. Bobby Tarantino ll is the seventh mixtape by the creator of the “1 800-273-8255” song (which happens to be the suicide hotline number), Logic. Apart from being his seventh mixtape, this album is the second installment to his previous –and surprise– 2016 mixtape Bobby Tarantino. The artist uses this album to prove that he’s more than just the “suicide song guy,” by rapping about various other topics. As an intro to the album, Logic uses the voices of Adult Swim’s Rick and Morty, who make a distinction between “Album Logic” and “Mixtape Logic.” In the skit, Ricky talks about how he doesn’t want to listen to something with a message about how you can be whatever you want, but instead is looking for something he can turn up to. This line hints at the playfulness that’s presented in the remaining songs on the mixtape. On the track “Yuck” the rapper talks about the “beef” he has with the people who don’t generally like him. Some speculate that he may be talking about the feud that the artist carries with Joyner Lucas, though he was never mentioned in the song. The rapper has since denied the claims that it he is referring to Lucas. In “Indica Badu (featuring Wiz Khalifa),” Logic and Khalifa both explain the beauty of smoking weed. Just like the sort of chill and nonchalant vibe that being high gives off, the song also displays a relaxed a vibey type of beat with its instrumentals, as well as ending on exactly 4:20, a number that hevely represents marijuana/smoking. Next comes “Wizard of Oz.” Much like the movie character, Logic compares himself to the one man that could solve everyone’s problems. He could be signifying that his music is helping the people that listen to him. Fans of his believe that the song is just a simple track to turn up to, it has no significant meaning other than to just have fun with. “Wassup (featuring Big Sean)” simply shows the two rising up above others in the music industry and making their own decisions without anyone interfering. On “Warm It Up” Logic revives his old persona, Young Sinatra. Many fans agree that Young Sinatra is the classic Logic that everyone missed from his old mixtapes. It gives the audience the sense that he has returned to his old roots and is staying true to his old self. “I really like ‘Warm It Up’ cause it sounds like his old stuff and makes me feel so nostalgic.” said sophomore Javier Ramos. On the outro track “44 More,” the artist raps one single verse with exactly 44 bars. This happens to be one of the tracks where he talks about everything from his family issues, to the people who doubted him, all while simultaneously boasting about his presence in the rap industry. This song is also a sequel to 44 Bars on the first Bobby Tarantino mixtape. Despite news that he and his wife are splitting, musically, Logic is on top of the world. 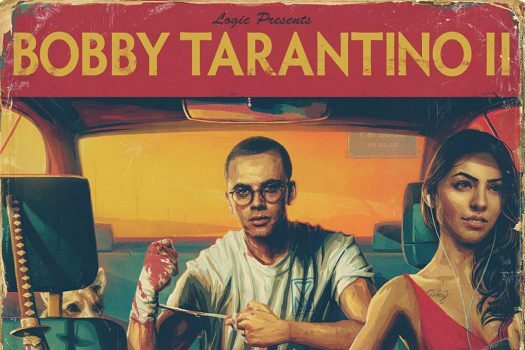 Bobby Tarantino II has hit No. 1 on the Billboard 200 chart.